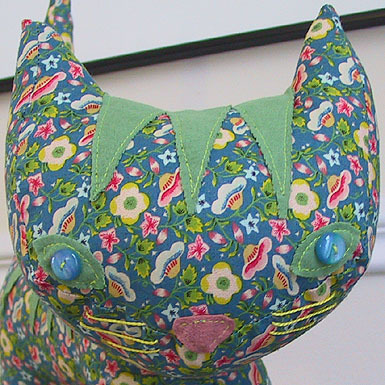 A flowered tabby cat with green stripes, a pink suede nose and blue buttons for eyes. 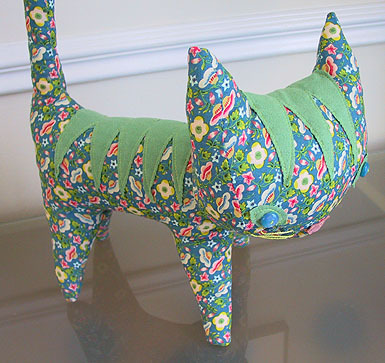 This is the cat pattern I was designing the other day. I feel like I finally got it right. I was looking for a good balance of angular and round. 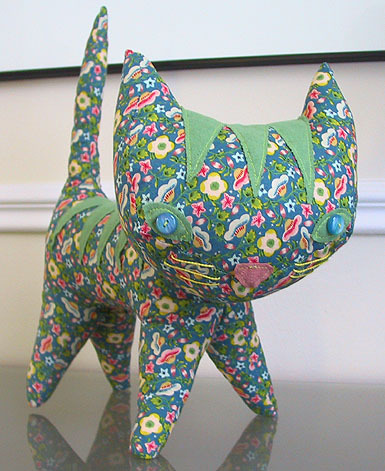 After many test cats with way too big heads and super skinny legs and seams busting open, here’s the one that worked! She’s lovely! The fabric and your choice of accent colors are gorgeous. How fabulous – totally worth all the effort if you ask me! I can’t let my daughter see it, she is tabby crazy and will have to have one (and I’m still working up to cutting out the little doggie). Thanks for sharing. My daughter saw the kitty and said, “Meow meow. Cute.” I agree! yeah! thanks so much for all the nice comments!! you’re making me & my new kitty very happy. I think I may have to make her some friends. Maybe smaller ones? smaller is always cute. Also I’m inspired to attempt some of the other creatures I have living in my head now that I’ve had some 3D success! Adrian, thanks 🙂 I’ve been loving this fabric for a while now and I’m so happy to have found a good use for it. Melanie, meow meow back to your cutie Eleanor! Stripes are flannel. I’ve been loving flannel lately. Especially the printed ones at the quilt shops. the pointy little feet are so cute!